Are you moving soon? 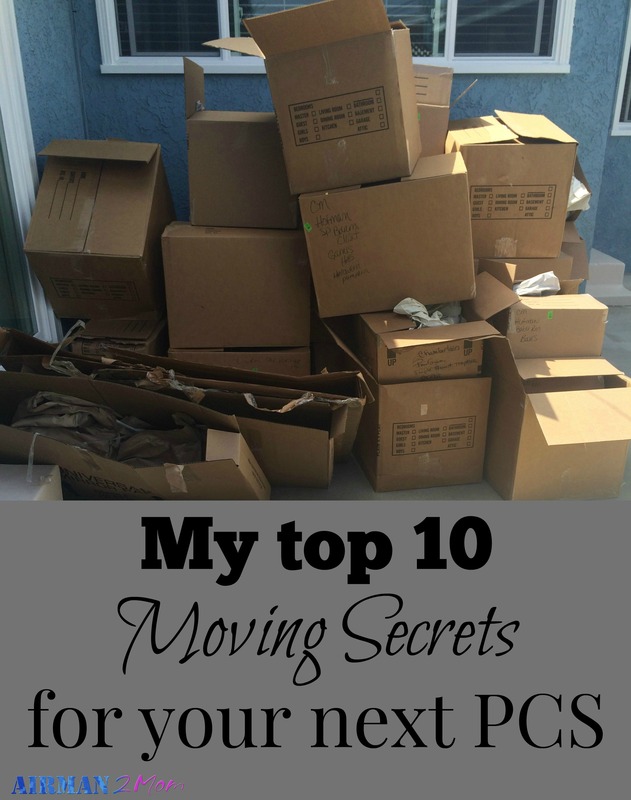 I have you covered with my 10 best moving tips to help you prepare for a move. It doesn’t matter if you are moving across town or across the country it is hard to move. And it is a lot of work. If you are a military family you know that military families typically move every 3 to 4 years. But it could be even more often than that when you account for schools, special assignment or the large miscellaneous other category. We have moved 3 times because of the military. The first two times my husband and I moved separately. But this last move from Ohio to LA we were together. I know how important it is to be prepared for a move. Truthfully, for my first move I didn’t realize how much prep work was required by my family before the movers came to pack up our stuff. Moving is a lot of work and it won’t be easy. But there are ways to make your transition easier. Finding ways to making packing up your stuff and moving across the country just a little easier will help you keep your sanity and make the moving process more enjoyable for everyone. And as an added bonus a lot of these tips help you with unpacking too. You are welcome!! With younger kids. You can let the kids scribble in boxes with a different color for each room. This gave them something to do and kept me a little more organized. 2. Put as many things as possible in Ziploc baggies. Silverware, spices, anything in the kitchen that will fit. Socks, underwear, bathroom items to be packed together. Especially toy sets. All small articles (and pieces of toy sets) that belong together will be together! Garbage Bag upside down over a grip of hanging clothes then tie the bottom. Buy boxes that are all the same size. Makes packing a trailer super easy. Use soft things like towels and bedding to pack breakables so you use less packing paper. Cover wood furniture with large blankets and then saran wrap. Use ratchet straps in an X from corner to corner of the trailer to keep things from shifting. Leave enough room at the top to slide your mattresses up on the top of everything. Disassembled items will be less likely to be damaged. Remove all pictures from walls before the moving company arrives. About a month before you leave try to use up all the items in your pantry. Have no-spend weeks where you make creative meals with all the items in your freezer and pantry instead of throwing it away when you move. Another Day 1 in the new house box: Include a roll of toilet paper, soap, disposable plates, scissors, a couple trash bags, Clorox wipes and maybe even instant coffee. Ask the moving company for a spare roll of their tape and a box. Move things that are important to you if possible. Pick a room (extra bathroom is what we pick) to put stuff you don’t want to move. Then everything you don’t want to move will be in one room and you don’t have to worry about it while the movers are there. If you are moving yourself, try to have regularly scheduled spaces of time where you can get stuff done. Either alternate with your spouse or have a friend or babysitter watch your kids. What did I miss? What moving hacks have help you with your move. Comment below. Great tips from someone who definitley has plenty of experience. #5 is a really good idea even if it does seem like extra effort at first, it’s worth it in the long run. It sure is. My husband has a bunch of boxes for his electronics and it took a lot of time to pack them up, but when the movers came and saw the boxes they said they would have just moved empty boxes and not taken the time to pack them in the original boxes. Looking back I wish we would have disassembled more stuff to help ensure we didn’t lose pieces. We got lucky and only lost a few bolts that were easily replaced. This is great! I got some new ideas! Hank you so much. We want to do a DITY move this next summer so believe it or not I’m already starting to organize and pack. Wow a DITY, that is a lot of work. Have you talked to people who have done it? I bet they could give you even more tips. Great informational post!!! I wish I had heard about the Ziploc baggie trick when I was a new Marine Spouse – it would have helped a ton. I did use this tip the last two moves and it made a world of difference. I especially loved having all my clean kitchen towels still clean when they arrived at the new house along with utensils that I did not want to have to wash all over again!!!! I actually didn’t know about this tip until I got advice from my Facebook friends. I am going to use it when we move. It is the best moving tip ever! If you are having a moving company move you, or have friends helping you out, feed them and have drinks handy. It makes a difference in how the movers treat your items. Also moving is always a good time to donate items. We make sure to go through each room weeks before and start donation boxes. When we did a dity move, we taped off an empty area in the house and started stacking the boxes as we packed them (weeks before). Even though we are retired, I have a feeling we will be moving a few more times. As always a great blog. It is funny you recommend feeding them. NextGen Milspouse recently wrote about how they don’t feed their movers and still get people who take care of their stuff. I wonder if it is something people think they have to do but really doesn’t matter. We do feed our movers though. And PCSing purging is great.